While my post last week was of the more serious and slightly depressing variety, this week it’s my hope to lift the recently disheartened spirits of my loyal Quebec readers. So this one goes out to La Belle Province,and hopefully it will give all our provincial neighbours a better understanding of why we’ve chosen to live in our pothole-filled, baseball-less, hijab-less wonderland. Recently there’s been a lot of talk around town about corruption, about the politics of our Parti-Quebecois government, and many people have been expressing their anxieties about life in Quebec. Why do we pay higher taxes than the rest of the humans on planet Earth and why do we put up with the general nonsense of this place we call home? Well, I started thinking about it from a tax/financial standpoint and decided to do a little digging. What I discovered was a bit surprising and may prompt some of you adopted Ontarians to return to your Quebec homeland. If your family income is less than about $50,000 and you have one or more kids, you’re much better off – financially – in Quebec. If you’re earning $100,000 or more, you’re just a bit worse off, but you still get more free medical services (assuming you’re a patient person…pun intended). Add to the mix the fact that Quebec is the only province with a $7/day daycare program and your annual savings will be….assuming my math is correct…millions of dollars!!! There you go! Easy as pie. It’s so simple that even the average Revenue Quebec employee could have figured it out. But probably not. Fine, fine…there’s more to it than that. If you think you’re paying more tax here in Quebec, you’re only half right. For the middle-classers earning between $50,000 and $100,000 per year as a family, you will be paying more income tax (call it an average of about 2-3%). However, Quebec’s social programs crush those in Ontario (and all other provinces and countries- unless you’re lucky enough to live in Sweden!). Federal and additional credits for Quebec! 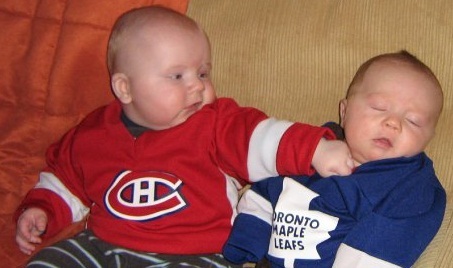 Yes, however your hockey team is either the Ottawa Senators or the Toronto Maple Leafs. Yuck. The Quebec child assistance payment alone comes to almost $3,500/year for 2 kids, more than offsetting any extra taxes paid on your income. Add to that the solidarity tax credit and the extra tuition credits available to those who attend CEGEP and University while living in Quebec and our infinitely superior dominance over our neighbour to the west becomes crystal clear. Plus – let’s be honest – nothing beats a Montreal winter! Don’t forget $7/day daycare. That’s a huge benefit – financially. We’ll likely leave the province when my child “graduates”. Next Post TTT: Back Taxes – Cash Coming Your Way!